Setting up a web server: It might be too heavy (may eat up a lot of resources), we will need to investigate on this. Open the file directly from the bundle: This is much lighter but after thinking about this for a bit I can think of some challenges. Let's say we are truly offline. And we want to serve everything locally from the bundle. In this case, even the example you added wouldn't work, since the images are still being loaded remotely (example) To make this work, I can imagine adding all the images to the project and maybe refer to them http://local/avatar1.png, http://local/avatar2.png etc. In this case, the challenge would be to make sure there's no collision in the image file names. Also, you wouldn't be able to make $network.request action calls either (since it's offline). I still haven't given up on the approach#1 (which you first came up with) and still think it can have some exciting usage, but I'm not so familiar with how much load having a web server introduces. For example, we wouldn't be able to add the web server into the core module if it's running always and it drains the battery or affects rest of the performance. I really have no idea yet because I haven't used this in my apps before. So I think we will need to investigate. As for approach #2, what are your thoughts? Do you still think (after having used Jasonette for a bit) local JSON is useful, even with all these limitations? Also, I'm curious, was there a reason you switched from the web server approach to this approach? Was there a performance problem? For WebServer approach, the good thing about it is images and any other files we want the app to access can be handled without really adjusting most part of the JASON codebase. I think even for images, you stick with the local:// protocol. Using http://local can lead to problems. most part of the JASON codebase. I literally just had this idea just now, how about we use file:// url scheme instead of local? Just to be consistent with rest of the directory structure, maybe it's a good idea to place the local files under assets? I'm thinking maybe creating a json folder under assets and placing all json files there. 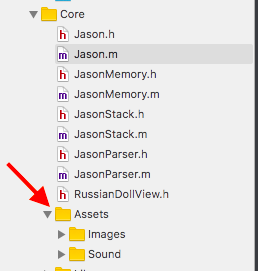 (And probably refer to them as something like file://json/hello.json) Basically this way we can access everything that's inside assets folder via file:// url scheme. I think once we can make decisions on these things we can go ahead and merge it in. What do you think? @gliechtenstein One small thing - I suggest that we name the folder based on its purpose/nature, rather than its type. For example, you wouldn't call Jpg instead of images or Wav instead of Sound. It's easier to understand and more scalable. @superboonie I think we can leave the naming up to users? My suggestion was use the Assets folder as root, so users can create whatever folder they want under the the Assets folder (or maybe even just put the files right at the Assets folder level). But your point still makes sense. I think it's good to have a default folder so that people can organize files better, otherwise people will just end up putting them under Assets folder. Maybe "data" or "document"? Please feel free to make a suggestion. @gliechtenstein Is the JSON mainly for UI rendering? If so maybe calling it UI will be suitable. Data is good but may be too generic in conveying what purpose it serves. In that sense I think document makes most sense so far, since it's a term that's both used to describe views (think html document) and models (think mongodb document). That said, this is just a side discussion. For this specific feature, all we need is an ability to set the main url for a view, which this pull request already does. Sorry guys, I've been meaning to merge this, but been focused on Android for the last couple of weeks so didn't want to introduce any complication on the iOS side. I've already discussed with @copongcopong and the code is pretty much ready to go, so will try to get it merged soon. Will keep you posted! Ok finally got around to merging this. I was trying to cherrypick the commits and something went wrong along the way so it got kind of hairy but managed to get it working now. Oh by the way @copongcopong I also fixed the problem with the http:// automatically getting attached in front of file:// (commit here) so the exception handling logic is not necessary anymore, so i removed that part as well. Refer to it from settings.plist, for example file://hello.json (Note that XCode projects don't maintain file/folder hierarchy so you can't do stuff like file://documents/hello.json. It's always file:// followed by the filename. Thanks for the pull request and sorry it took so long! Hi. Is the file:// local resource feature available on Android too?